Acquire Kahvozein's Fang and use it to get heartscales from a dragon for Tolfdir. Talk to Tolfdir in the College of Winterhold when your Alteration skill is 90 or higher. To initiate this quest, you must have an Alteration skill of 90 or higher. Speak with Tolfdir and ask if there is anything new that he can teach you. He tells you that he has been working on a new spell but, to complete his research, he needs heartscales. These must be cut from a dragon's skeleton and can only be done using a dagger called Kahvozein's Fang. He asks you to retrieve the blade, which can be found in a radiant dragon priest dungeon. Once you have the dagger, you must either slay a dragon or locate a dragon corpse in order to retrieve the heartscales. If you intend on hunting down a live dragon, it is not necessary to slay it using Kahvozein's Fang. You need only equip the dagger in your right hand (it won't work with your left hand) and loot the creature's corpse. The heartscales will automatically be added to your inventory. Once you have the scales, bring them back to Tolfdir. He will reward you with the Dragonhide spell tome, and will now sell the Mass Paralysis spell tome. It is possible to find Kahvozein's Fang in a dungeon and collect heartscales from a dragon's corpse before the quest is given. You can harvest heartscales even if the dragon disintegrates. Once the quest is complete, you can continue to use the Fang to collect a heartscale from each dragon corpse, in addition to the standard dragon loot. These scales can't be used for crafting, but are no longer quest items and can be sold to vendors. While it is not required to complete Dragon Rising to start this quest, completing it is necessary in order to find a dragon suitable for heartscale harvesting. 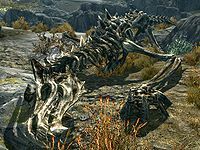 Although the Skeletal Dragon can be found and defeated beforehand, it does not yield scales of any kind. Heartscales cannot be harvested from KrosulhahDB either. If you reset your Alteration skill to 15 using the legendary mechanic after starting this quest, you will not be able to turn it in to Tolfdir until you bring your skill back up to at least 90. In your quest log, this quest is mistakenly decorated with the Side Quests knotwork (as displayed in the quest header), instead of the correct College of Winterhold knotwork that is shown on all other college quests. This does not have any known effect on gameplay. In particular, this quest is not considered to be a Side Quest for the purpose of the Sideways achievement. Mod Notes: The quest Type is "None" instead of "Mages Guild"
After retrieving the heart scales, it is possible that you will not be able to talk to Tolfdir and you will be unable to finish the quest. You can complete the quest by using the console command player.setstage 000D0755 200. The name of the dagger is shown as "Kavohzein's Fang" (different spelling) in both the Quest List objective and the map objective text. 200 Finishes quest I've assisted Tolfdir in his research by collecting dragon heartscales, which he needed to figure out a new Alteration spell. As a reward for helping him, he's given me the first copy of the tome. The following empty quest stages were omitted from the table: 30, 40. On the PC, it is possible to use the console to advance through the quest by entering setstage MGRitual05 stage, where stage is the number of the stage you wish to complete. It is not possible to un-complete (i.e. go back) quest stages, but it is possible to clear all stages of the quest using resetquest MGRitual05. This page was last modified on 26 January 2018, at 01:57.